Ground penetrating radar offers an accurate, non-destructive solution to mapping underground features. 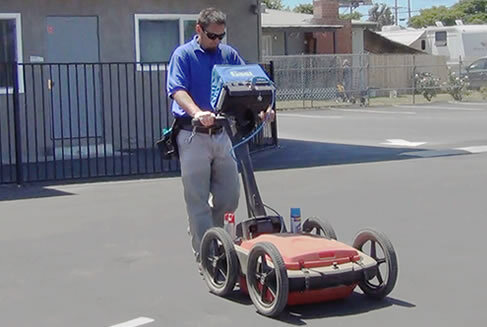 With GPR, it is simple to locate items of interest easily, saving time and costly errors. GPR is useful in discovering the location of buried fuel or oil tanks, hazardous material tanks, septic tanks and other underground features prior to excavation. GPR is used to accurately locate grave sites prior to moving or renovating memorial facilities or potential native people's burial grounds. Excavating human remains accidently can cause many unexpected problems. Ground penetrating radar is a key tool used by law enforcement and crime scene investigators for locating unmarked burial sites and objects. GPR has been instrumental in locating victims, caches of weapons or evidence, and stolen goods. Security companies use ground penetrating radar to locate the presence of tunnels or detect movement near exterior walls or in buildings. ART can map your location accurately and provide critical information about the nature of underground features and buried objects. ART can assure that you have complete information and can make informed choices before taking action.